This entry was posted in AeroLogic and tagged 777, AeroLogic, Boeing, Boeing 777, HKG, Hong Kong on January 12, 2015 by Bruce Drum. Atlas Air Worldwide Holdings, Inc. (New York) today announced the acquisition of a Boeing 777 Freighter by its dry-leasing subsidiary, Titan Aviation. The aircraft is currently on long-term lease to AeroLogic GmbH (Leipzig), a cargo airline based in Germany and a joint venture of DHL Express and Lufthansa Cargo AG. “With the purchase of this 777 freighter, we gain entry into an attractive aircraft type consistent with our strategy of investing in new technology that creates superior value for our customers,” said William J. Flynn, President and Chief Executive Officer, Atlas Air Worldwide. Copyright Photo: Nick Dean. AeroLogic’s Boeing 777-FZN D-AALC (msn 36003) is pictured at Everett (Paine Field) prior to its handover. This entry was posted in AeroLogic and tagged 36003, 777, 777200, 777200F, 777F, 777FZN, AeroLogic, aviation, Boeing, Boeing 777, boeing 777 freighter, Boeing 777200, Boeing 777F, DAALC, Everett, PAE, Paine Field, transportation on March 11, 2013 by Bruce Drum. Please click on photo for full view, information and other hot photos. 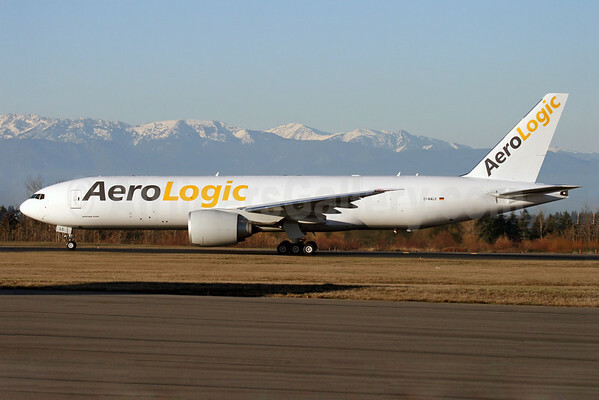 AeroLogic (Leipzig/Halle), the joint cargo airline of DHL Express and Lufthansa Cargo, yesterday (June 19) launched operations after receiving its AOC. The airline will initially serve the route Leipzig – Bahrain – Singapore – Delhi – Leipzig on weekdays and the route Leipzig – Tashkent – Hong Kong – Tashkent – Leipzig on weekends. By 2010, the airline will gradually expand the network to offer new direct connections to most of Asia’s major metropolitan areas. The new airline will operate with eight leased new Boeing 777F freighters, the first four of which are expected to be delivered this year. The 777F has a maximum payload capacity of 103 tons and can fly distances of over 9000 km, which enables non-stop flights from AeroLogic’s home base of Leipzig/Halle to key Asian growth markets. This entry was posted in AeroLogic and tagged 36001, 777, 777-FZN, 777F, AeroLogic, Airliners, Airlines, Boeing, D-AALA, Kok Chwee (K.C.) Sim, New Airline, SIN, Singapore on June 20, 2009 by Bruce Drum. 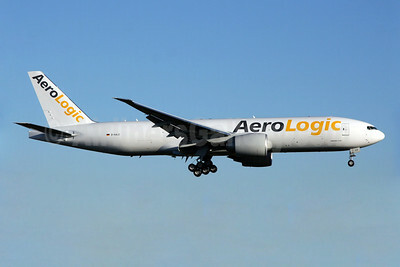 AeroLogic (Leipzig) took delivery of its first (of eight) new Boeing 777-FZN (D-AALA, msn 36001) on May 12 via Deucalion Capital. The new cargo airline is a joint venture between Lufthansa Cargo and DHL Express and is expected to launch operations in the coming weeks. This entry was posted in AeroLogic, DHL Express, Lufthansa Cargo and tagged 36001, 777, 777-FZN, 777F, AeroLogic, Boeing, D-AALA, DHL Express, Lufthansa Cargo, New Airline on May 25, 2009 by Bruce Drum.